How are pillar lights affixed? Can you get pillar lights with solar? What materials are pillar lights made of? Looking for round and elegant? Which IP code does my pillar light need? Not sure which model to go for? Take a look at our Guide to pillar lights. As the name suggests, pillar lights tend to come on pillars. But they are also happy on walls, terraces and paths. They do not just create a lovely ambience in gardens; they also make it easier to find your way. 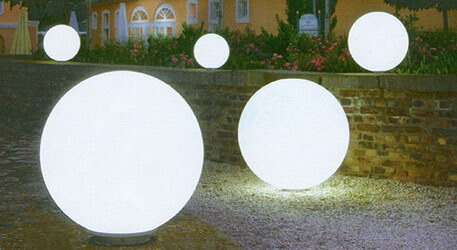 With a height of between 40 and 50 centimetres, they are like “the dwarves of outdoor lights”. But as they rarely sit directly on the ground, they are also able to compete with their big brothers – the post lights. 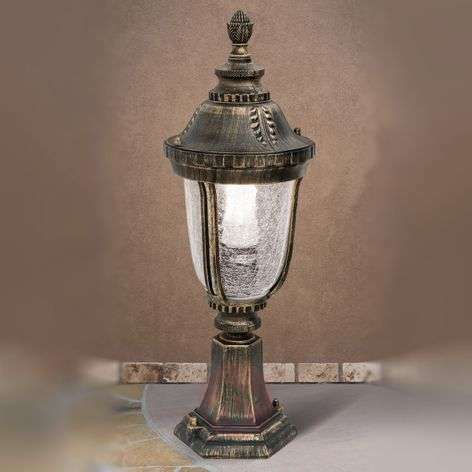 And so, when placed on a base, a small pillar light can have a light effect similar to that of a stately post light. They often stand on a raised platform. Then they can be directly screwed into the base. When installing them on the ground, we recommend installing them on a frost-proof stand or on a similarly solid material. This will give your pillar light a secure footing. 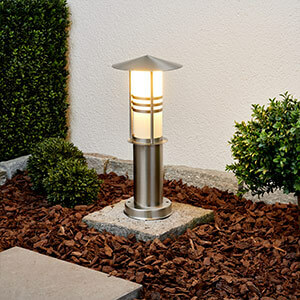 If you don’t want it fixed in place, you would be well-advised to opt for a pillar light with a ground spike. 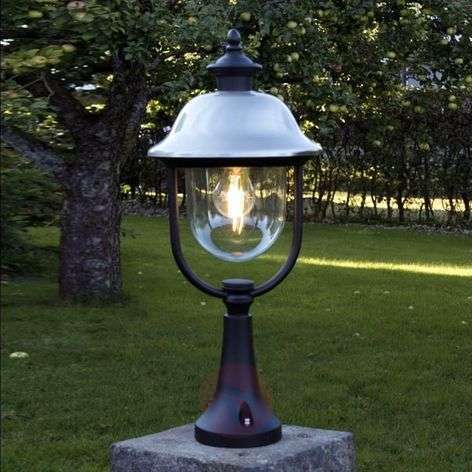 Then you are free to move the light around as required and can try it in different spots – perhaps to highlight a flower in bloom, or maybe to put the spotlight on a lovely shrub. DIY is not advisable when it comes to electrics. 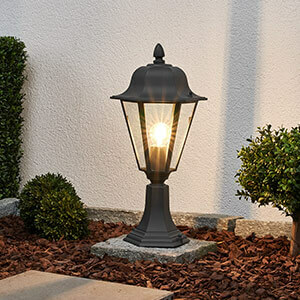 Pillar lights, which are connected to the mains via underground cables, should always be installed by a professional, or you should at least consult an electrician for advice first. Please phone our team of experts if you have any questions. The contact information is listed below. 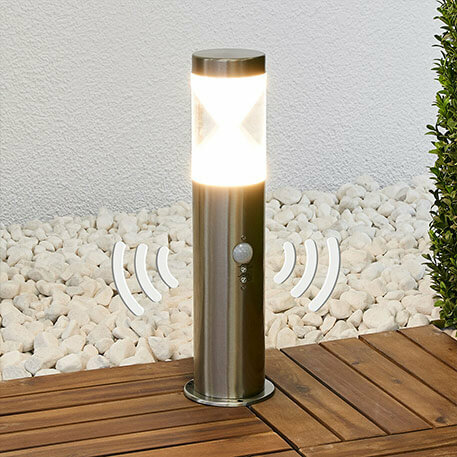 A pillar light fitted with a motion detector is even more practical: the light only shines when it is needed. And it turns itself off again after a certain period of time – ergo, you save electricity. And you protect the battery within your solar light. Motion detectors also make your garden safer and more secure. On the one hand, you are less lightly to trip on a garden hose; on the other, burglars will be put off by the light. When it comes to the detection angle of pillar lights, take note of the following: if it is too large, it will include your neighbour’s property; if it is too small, the light will only come on if you are in a very specific spot – perfect for intruders! Most models come with a detection angle of 120 degrees. This is sufficient to cover paths and driveways. If you want the light to shine when you approach via your lawn too, you will need a larger detection angle. You can opt for a 360-degree motion detector and use panels to customise the light. Using the sun as a source of energy? It is both environmentally friendly and practical. There are no electricity costs and a tangle of cables is a thing of the past. 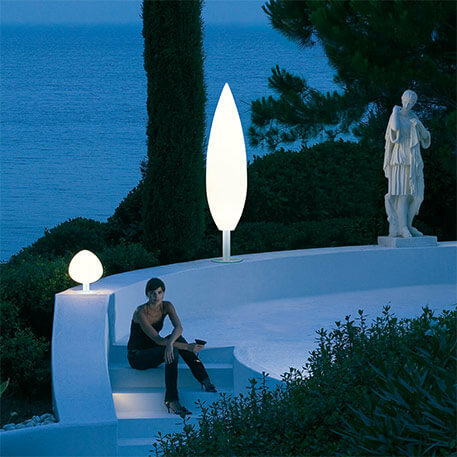 Solar-powered pillar lights generally come with a ground spike, hence they are flexible. They can be easily moved to a different location. They are perfect for design fans. 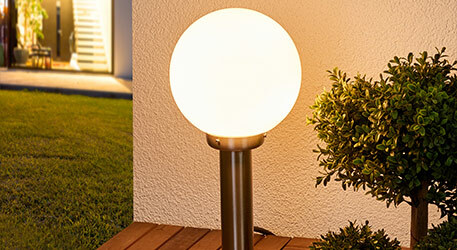 Tip: solar-powered pillar lights are best positioned where they can soak up a lot of sunshine during the day. Otherwise the battery won’t charge fully. Durability is desirable. Robust stainless steel ticks the box here. 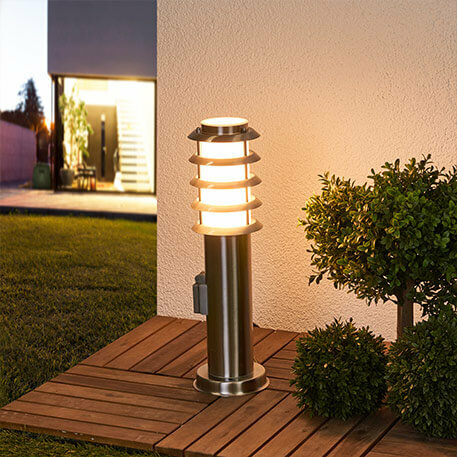 You can also get pillar lights made of aluminium and other metals, which are suitable for use outside. In order to ensure that the bulb is well-protected but can still shine brightly, glass or plastic lampshades are a good option. 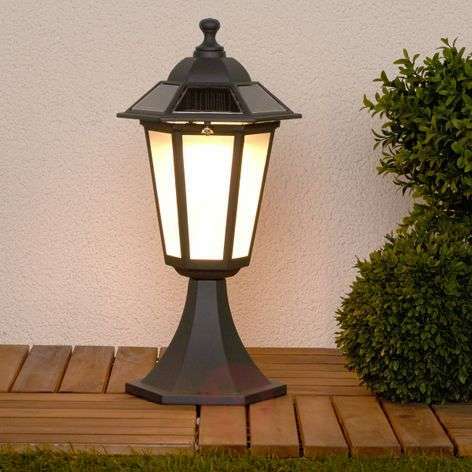 All you need to do now is make your choice and get started with outdoor lighting. Our team of experts is on hand to help you with practical tips – find their contact details below. Do you want to be able to quickly charge your phone whilst in the garden? Want to be able to use the hedge trimmer without having to drag an extension cable around behind you? No problem if you opt for a pillar light that provides both light and electricity. With a power point as an extra feature, they bring far more functionality to the garden than their name suggests. 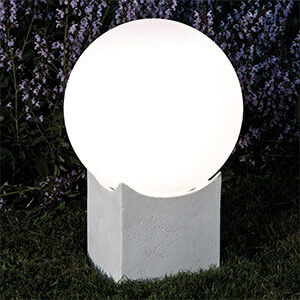 This is a popular version of a pillar light: the frame is crowned by an illuminating sphere – an opal white version will create a lovely atmosphere. It softly filters the light. The surroundings are lit evenly and look very inviting. 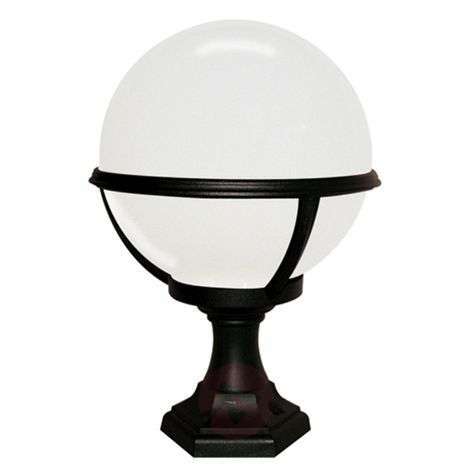 Pillar lights with a spherical glass lampshade exude elegance on the edge of paths, as well as on walls and other elevations. Another popular choice: the sphere without a frame. Pay attention to the IP code, for example IP44. The first digit refers to the level of protection against foreign bodies. The second digit provides information about the moisture protection. 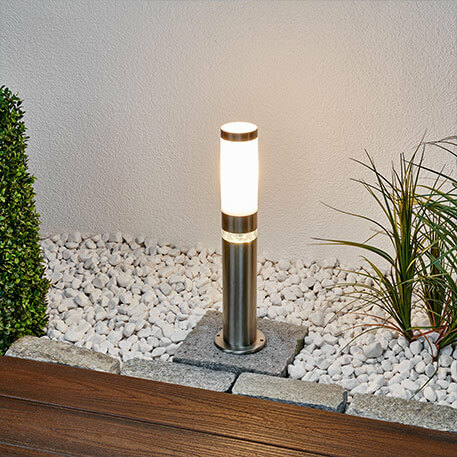 As rain can never be ruled out, your pillar lights should come with at least IP code IP44 – a higher IP code is, of course, no bad thing. IP44 provides protection against foreign bodies over one millimetre in size, and against spray water. Thus, you can be sure that your pillar lights – including the electrics – are safe against the rain and will not become hazardous. Do you want to know more about pillar lights? Simply call our team of experts on +353 1 699 2138 or get in touch using our contact form– we promise to get back to you as soon as we can.